The No 1 UK homecare franchise, which provides quality care for older people in their own homes, celebrates its latest outstanding rating with mum-of-two Amanda Hamer. As a homecare franchisee, Amanda was driven by a desire to see quality care delivered for older generations, care of a standard that would be good enough for her own mum to receive. Passionate about homecare that older people could trust and rely upon, care that allows them to continue living in their own homes, surrounded by a lifetime of memories, she started her business in August 2011 underpinned by the ‘mum test’ ethos. 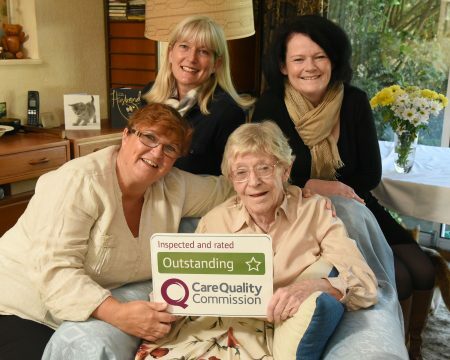 Five years on, Amanda’s personal passion for quality homecare and companionship for seniors has been recognised with an Outstanding Rating – the highest rating possible – from the Care Quality Commission (CQC) in its new Ofsted-style system. With services marked over five categories: safe, effective, caring, responsive and well-led, the CQC’s Ofsted-style rating recognises the importance of compliance and credits overall quality of care service. And her homecare company Home Instead Senior Care which provides care that passes ‘the mum test’ to seniors across Gloucestershire has become the first homecare company in the county to receive an Outstanding Rating. With visits that last a minimum of one hour, and clients and CAREGivers matched according to hobbies, interests, even star signs, Amanda’s team, which includes over 80 CAREGivers and nine office-based employees, has passed the ‘mum test’ with flying colours. “Receiving an Outstanding rating is validation that we do what we say we do here. We believe in personalised care that should reflect elderly people’s wishes and dreams,” said Amanda who previously worked as a Corporate Director in local government before moving into the care sector. Inspired to make a new start in elderly care by her sister, who works with older people in Occupational Therapy, and her sister-in-law, who manages a hospice, Amanda felt she wanted a career change that would see her working with older people and putting something back into her local community too. But it was when she met Home Instead Senior Care at the National Franchise Exhibition that she instantly knew she had found “her kind of organisation” and a network to franchise with. “The more people I met, from the founders, to the support team, to the franchisees, I could see that it was a genuinely caring network. It was all real and I could see my own values, ethos and ethics matched. “The support that I could draw down from National Office at any stage of my business lifecycle and the robustness of the business model made the decision to franchise with Home Instead crystal clear. Ruth Brown, Head of Franchise Development at Home Instead Senior Care, said: “Congratulations to Amanda who has brought home a super 7th Outstanding rating to our brand.